A cannon from the wreck of HMS Victory (1744). The most important marine discovery of the last decade turned up on terra firma: the silted Byzantine port of the Emperor Theodosius in Istanbul (CWA 58). Overlying the foundations of a Neolithic village, a staggering 32 wrecks dating between the 5th and 11th centuries have emerged at Yenikapı. The cargoes, unknown construction techniques, and oared galleys exposed by Istanbul University’s Conservation Department and the Institute of Nautical Archaeology at Texas A&M University will provide the ultimate statement on the evolution of Byzantine shipping. The last decade has been defined by the rise of the robots. Leading the way, Odyssey Marine Exploration has found hundreds of Punic- to Colonial-era shipwrecks in depths down to 2,000m. The company’s Atlas Shipwreck Survey of the western English Channel and Western Approaches is the most extensive offshore survey conducted worldwide. 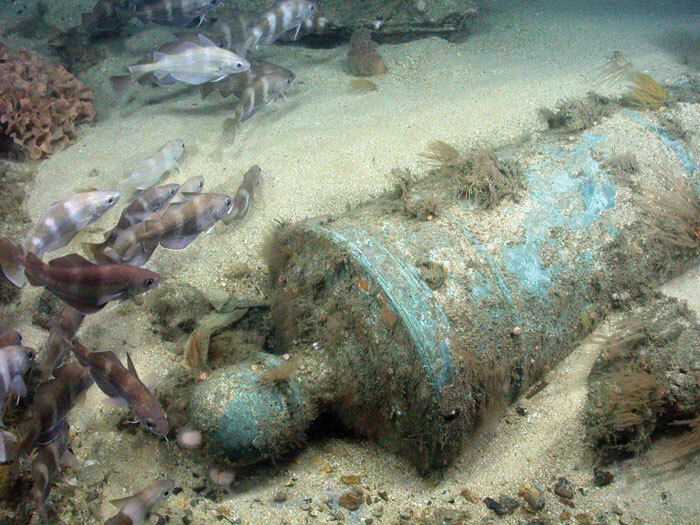 Of the 270 wrecks surveyed, a late 17th-century possible Royal Africa Company trader, the First Rate English warship HMS Victory from 1744 (CWA 34), the mid-18th-century Bordeaux privateer La Marquise de Tourny, and German U-boats continue to illuminate deep-sea British history. Nobody digs ships like France, which up to 2008 excavated two generation-defining privateers outside St Malo harbour: the 300-ton Dauphine, sunk in 1704, and the 400-ton Aimable Grenot, lost in 1749. The 3,000 artefacts recovered range from parts of hulls and rigging to cannon, surgeons’ instruments, pottery and wooden utensils used by sailors and officers, and a galley monkey. The greatest threat to our underwater cultural heritage is the fishing industry, which is bulldozing vast swathes of the sunken past: the unique English flagship HMS Victory, the greatest warship in the world when wrecked in 1744, is unlikely to survive the next decade if excavation is not given the green light. Without hard decisions and compromises, such sites blitzed by fishermen will be lost to society.